Pack of 5 Lighthouse Everslab Graded Coin Slabs with inserts. Lighthouse Everslab holders are secure and durable "semi-permanent" graded coin slabs designed for do-it-yourself coin grading. They snap together securely with a strong hold, but can be opened with a knife or sharp object if necessary. Unlike PCGS or NGC holders, these are not permanent and cannot be sonically sealed. However, Lighthouse's "semi-permanent" design holds together very nicely and is difficult to pull apart. 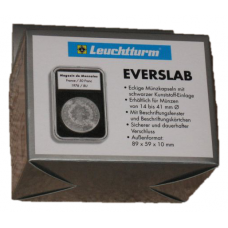 As they are similar in size to the major grading company's slabs, Everslab coin holders perfectly integrate into your current collection system for regular certified coin holders (slabs). 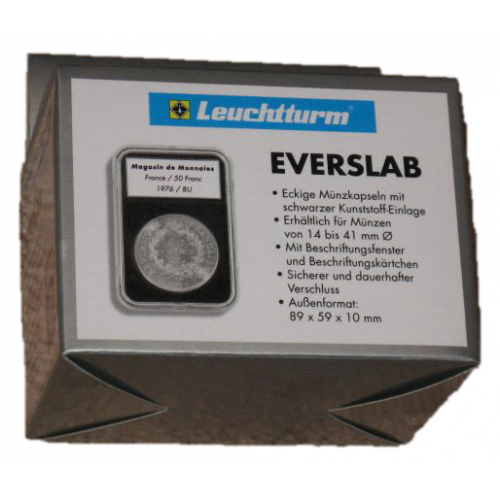 Everslab coin slabs are rectangular coin capsules with precise fit black inserts. Lighthouse Everslab holders are made from clear and scratch resistant plastic, and both holders and foam inserts are archival quality, acid free, chemically inert and free from PVC or other chemical softeners. 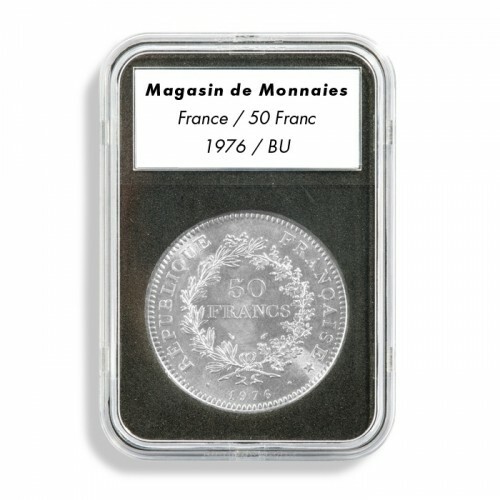 Each holder features a labeling field and come with a blank labeling card to display information about the coin. If replacement labeling cards are needed, Lighthouse offers a downloadable template on their US website. Overall size: 3 3/8 x 2 3/8 x 3/8 (85 x 60 x 10 mm). 38mm diameter hole in foam for coin. Do you have any questions about 5 Lighthouse EVERSLAB 38mm Graded Coin Slabs US Silver Dollar?